At extremes of the great Fram Strait melting zone lies the last remnants of sea ice, whose physical nature really becomes elastic, from solid to slush/rubber to water. It is a sight everywhere sea ice melts. In this frame, present Cirrus clouds may be confused with melting sea ice. At present, the Beaufort Gyre current is very healthy with rapid continuous ice floes for the melt slaughter, again to the point where we can't readily easily identify any ice pan which disintegrates in shape and size in a matter of days. Note in particular the apparent lack of day to day extent shrinking. JAXA and other Grids may show very little melt progress but there is in fact huge ongoing melting. Near 80 N water temperatures still with quite a lot of ice cover, was measured a very warm if not hot +.91 C July 22, by Mass Buoy 2015J last report. The arrow points to very near its location. Well further away from wide open water. This temperature means bye bye sea ice, and mass buoy 2015J should turn soon into a boat at any moment. What surprises is how dense the ice was with so warm a water under. The bottom thermistors read -1 C which may be more accurate, however throughout the winter the Buoy appears to have recorded very good water temps.Mass Buoy 2015f, well further North 83.49 North, has -1.4 C water. There are 2 more locations with 1 degree sst much nearer the Pole, likely retrieved from remote sensing. Those in circles are in doubt, not necessarily incorrect, although the one North of Greenland +28C may be judged incorrect. Note Chukchi sea +10 C North of Novaya Zemlya +6 C, incredibly warm waters. Cyclone July 26 opened up the ice much further, black water is seen near its centre, a particular place where sea water level rises more than at the far perimeter of the cloud waves. Prior to the cyclone, North of East Siberian sea was already quite open, part of the "Laptev bite" look. What is very interesting is the storm centre black zone. What is the difference with 2012? July 26 2012 same area had sea ice far less broken, which eventually melted/compacted at minima. 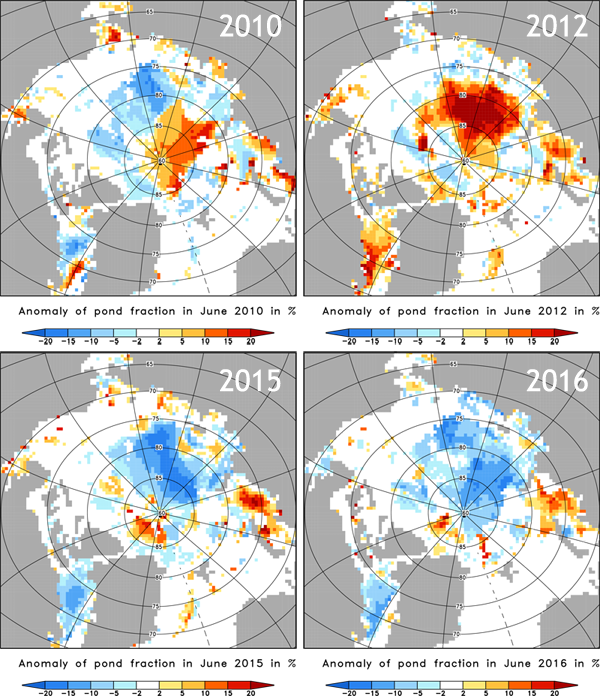 Although the East Siberian sea of 2016 had similar open water to the Laptev sea of 2012. Beaufort area 400,000 km2 almost permanent broken ice area is clearing/melting. Unless it is a big melt year, end of July usually offers a few clues about coming minima outlook. and complex by many varying geophysical parameters. Ice melts quicker when ice core temperature is close to 0 C. This is the main reason why melting occurs faster at end of July, there are of course other factors, which is warmer air and sea temperatures, but it is very difficult for surface air to warm a whole lot with the presence of sea ice2 meters below. From the constant presence of ice a summer temperature battle ensues, and thus temperatures without a great deal of very warm advection injections remain steady, especially by latent heat of fusion of ice, the warming can't really be measured by air temps. Eventually the most vulnerable sea ice, an ice pan surrounded by warmed sea water, vanishes quickly. 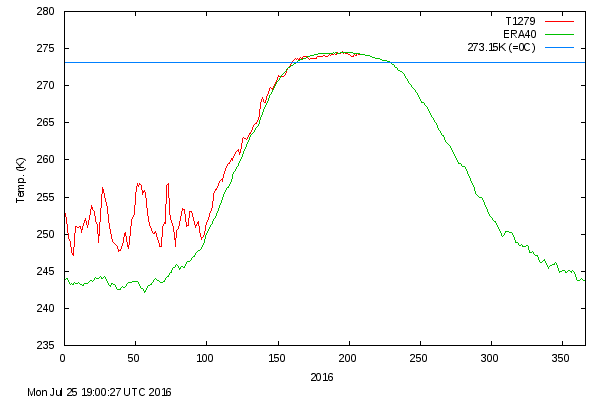 The melting point in the ice column was achieved by many pieces of sea ice as per July 25 2016, achieving a greater melt than all previous days. Before July 25, the smallest blocks of ice didn't survive very long, leaving the larger ones to travel Westwards. However now is the time when the greatest melting can happen, the heat transferred to sea ice, a continuous heat sink, renders sea ice to mush to melt to water. The only Mass Buoys currently active; 2015f 83.11 N 139.14W has an average core temperature above -1 C and strategically located Mass Buoy 2015 J 77.8N 157.16W has similar ice core temps. These buoys ice surface are more or less not surrounded by open water. Again, the latent heat of fusion of sea ice captures a lot of the heat otherwise manifested warmer on ground surfaces of the near by archipelago Islands. Laptev bites not so crunchy Northern ice, North Pole is beginning to open. Radically different melt seasons 4 years apart. 2016-2012 comparison. July13 to 23 2016, we see more or less a standard Melt pattern. The Laptev "bite", the Beaufort melting zone , Fram Strait particularly flowing a little less than usual. But we see a huge shatter zone of rubble ice making CAB extent all time lowest. 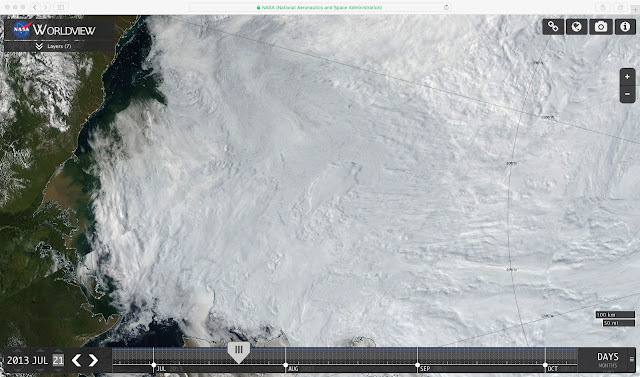 Turns out July 13-23 2012, was largely atypical, with the Gyre movement appearing to turn counterclockwise, with the Beaufort melt zone receiving ice From Northeastern Russian seas. A well covered Beaufort area to persist till refreeze, it was not exciting to watch, especially following 2012 melt season. 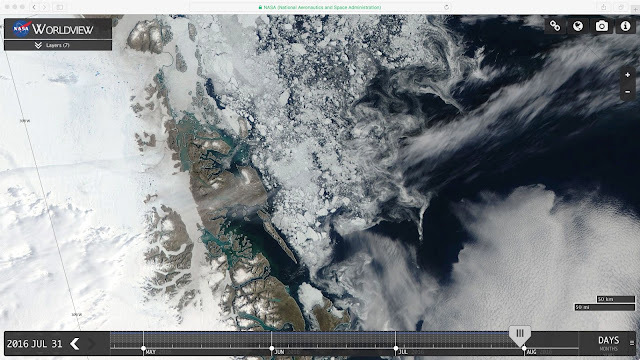 While Beaufort Sea ice melted long before July 21 2016. Beaufort Region became the prime Sea ice melting zone, shattering, thinning and melting sea ice during July 5 to 21 2016 period especially due to lingering Cyclones whisking by slowly combined with a persistent Gyre rotation. 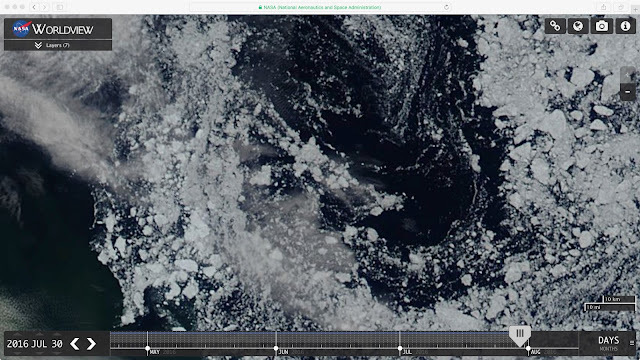 This shattering of sea ice caused a somewhat sluggish melt rate at times, in particular when winds spread out the ice in smaller parts more evenly. But open water/ice mix extent of sea ice is rather of disastrous quality, ready to vanish in a few days. The thinning of most of a good chunk CAB can be seen on July 21, with the best most strongest ice heading towards the melting block. Brings into question whether sea ice extent numbers really tells the pictures as above, thanks to NASA we understand reality better. ~ Fram Strait still has steady incoming ice as well. a large sea ice extent to remain Mid-September. But will that happen? JAXA captured intense activities, despite apparently a "slow June", if you look very carefully, there was a larger Gyre North of Alaska somehow turning ice clockwise, with a classic motion compaction, opening water more and furthering the melting process. 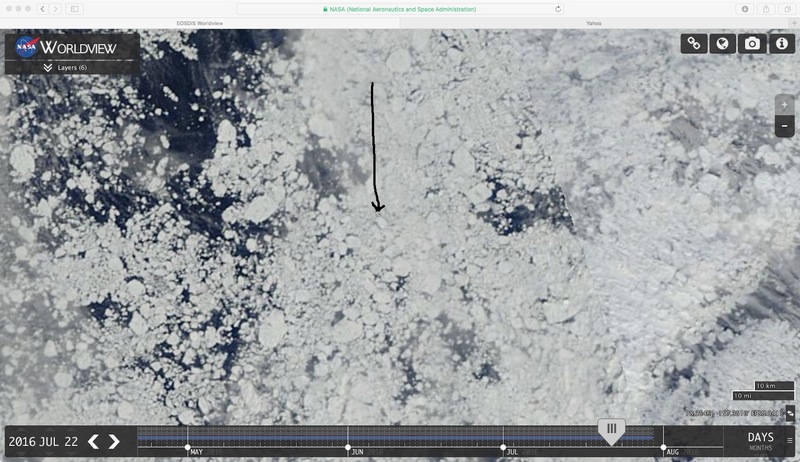 Another panhandle of slower melting ice is already in place, about Wardle Island, the now often appearing Laptev "bite" precedes a huge broken up ice field further North. Ice is receding on every front. Except Fram Strait which has a net output of sea ice. The greenish appearance of sea ice mid June, classic melt ponds colour, this is observed on the surface, a light green ice top world. Beaufort sea had record heat temperatures reported. But here we find again a hint, the models calculate surface temperatures too cold. It turns out that I have found North of Alaska model surface air calculation too cold, a few weeks ago, I made an example of it in June... The model output was in violation of above sea ice refraction prime rule: surface air can't be colder than top of sea ice, especially applicable in summer! When ice is a heat sink. Having been studying apparent illusions for years, it seems obvious that we are in for a greatest melt, despite smoke and mirrors clouds/fog and ice. Its not that natural illusions are set to deceive, rather, belief in a conclusion far away from now, does that quite well. WD June 12, 2016 (few seconds before midnight)..
~2013 like Gyre stall possible but 2016 July icescape not at all like 2013. What was hiding under the latest stable cyclone at about the Pole? A sea water with broken pack ice mix much greater than 2013. same date 82 N 150 E. 2016 has severely less ice, its good for cloudy Cyclones.